One of the best things about Pokemon Go is it gives you a chance to learn more about where you live. In partnership with the Windsor Public Library and Maptime Windsor-Essex, we will be teaching people how to use Google Maps to mark out PokéStops and PokéGyms, so we can pick the best routes to help you catch them all! Plus we’ll be mapping other important spots downtown that can help make the game more accessible, like wifi hotspots and bus stops. We will then be sharing the results with a publicly available online map of key PokéSpots in Windsor. Free and great for the whole family! Inspired by the event, I thought I would try out my own Pokémap. Well, what I made is not my map. It’s my personalized version of the Pokemon inspired map that was made by Saman Bemel Benrud of Mapbox in July. I followed Saman’s instructions how to make my own playful theme using Mapbox studio and I added the googley eyes using Inkscape as an excuse to do some playing around with SVG. From my understanding, it’s mobile devices that are driving the use of vector mapping frameworks as they are faster and more responsive than the raster-tiles of the maps that we’ve been used to, since Google Maps. Or perhaps it’s games that is driving this change? Pokémon Go was built using Unity and just last week, Mapbox published a blog post on August 30th that begins.. The new plugin uses soon-to-be-released Mapbox tilesets specifically designed for gaming. These new tilesets contain compressed elevation data and building heights. Just like the the vector tiles that power Mapbox Streets they are super light for fast loading and updated minutely. As a city changes, levels can be updated from fresh data, letting developers model their own game environment based on the latest maps. As the city changes, so will your game. In 1971, deaths by motor vehicles reached record levels, with 3,300 people dead, 500 of whom were children. How many children will have to be killed in Canada before we legislate that protected cycling infrastructure is included by default for every new road and made available on existing streets, whenever possible? There are so many reasons why I advocate for better cycling infrastructure in Canada. Better cycling infrastructure: supports healthier lifestyles, causes less pollution, helps local businesses, creates tourism opportunities, is more equitable to people of low income, makes communities accessible to those who can’t or no longer can drive cars and, of course, will save the lives of people we love and know in our community. At the end of last month I had the pleasure of being a part of the Windsor Bike Summit and I learned so much about the shape of cycling advocacy today in Ontario and across Canada. There are remarkable developments in promoting cycling that are happening all around Windsor and to help bring these sort of developments to where I live, I became a member of Bike Windsor Essex, one of many cycling advocacy groups that you can find across the country. 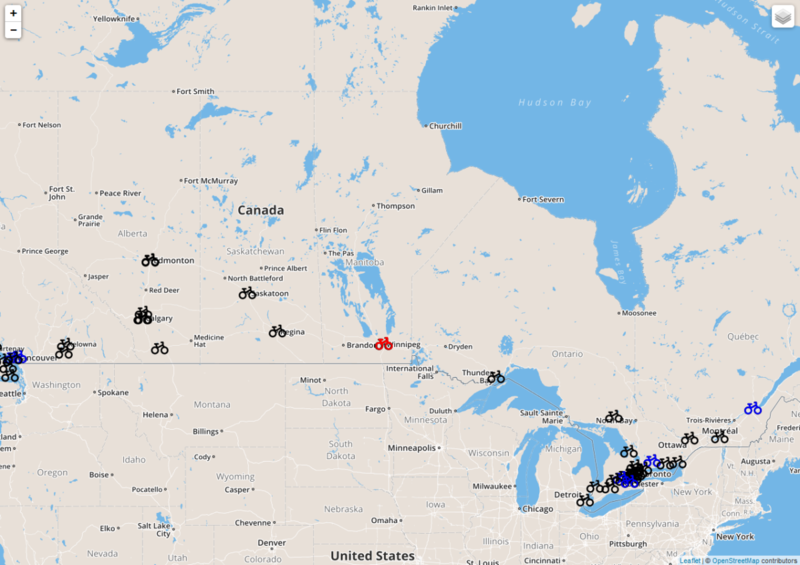 In order to help others find their local cycling advocacy groups to join, or support, I created this national map of Canadian Cycling Advocacy Groups. (If you live in Toronto, click on the box in the top right corner of the map to find the Ward Groups of Cycle Toronto). If wishes were horses, beggars would ride. We need to do more than wish if we want to keep ourselves and our loved ones safe on our streets.